This week’s Riverfront Times details a cross-cultural love story that lately has helped to bolster the connections between St. Louis and Nanjing, China, which next year will mark 40 years as sister cities. The story’s author is Ryan Krull, assistant teaching professor in the Department of Communication & Media at the University of Missouri–St. Louis, who began reporting it last summer while doing his own cultural exchange. Krull spent time as a fellow at the Chinese Academy of Social Sciences in Beijing as part of a partnership between the academy and UMSL that has aimed to spur research collaboration between faculty members of both for nearly 20 years. Krull left for the two-week fellowship with a goal to learn as much as he could about the new media landscape in the world’s most populous nation. 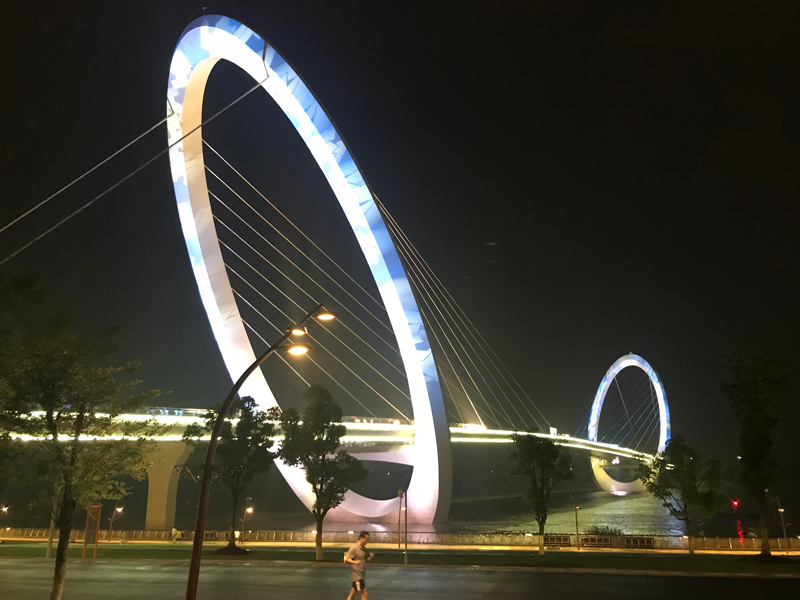 The Nanjing Eye Pedestrian Bridge spans the width of the Yangtze River. Ryan Krull visited Nanjing and recently published a Riverfront Times story about the sister city relationship it has with St. Louis. Platforms such as Facebook and Twitter are blocked in China, where the Communist government still maintains a measure of control over the flow of information. Krull observed Chinese people no less glued to their smartphones than Americans for social media interaction and more. “By far the most popular social media app in China is WeChat, which is basically a quasi-private messaging service,” Krull said. “It’s sort of like Facebook, also like Twitter. It is definitely China’s PayPal, Uber and Yelp, too. It’s like one unified app that brings together a lot of things that are disparate apps here in the U.S.
What’s more, because developers have access to so much more data in WeChat’s one-stop-shop format, they provide users with even more of the content that will keep them connected. Hung-Gay Fung, the Dr. Y.S. Tsiang Professor of Chinese Studies and Curators’ Professor of Finance at UMSL, was responsible for first setting up the exchange program that sent Krull to China. International Studies and Programs has managed the program, which sends two faculty members each year to Beijing for two weeks. With funding from Fung’s endowed professorship, UMSL provides them a stipend to cover their travel expenses while CASS covers the cost of their meals and accommodations. CASS also sends two faculty members to UMSL, though for longer periods, as part of the exchange. Glassman said Krull was something of an outlier in that he didn’t have a specific research agenda, but he was eager to take part after first visiting China and going to Fudan University as a teaching assistant in 2014 while pursuing his MFA in creative writing at UMSL. 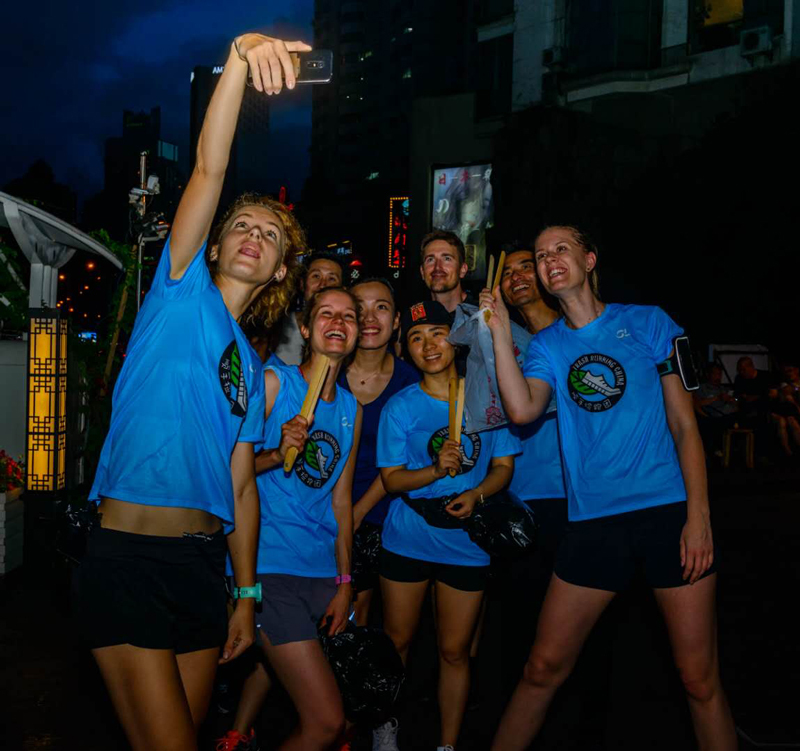 Ryan Krull published a story in Atlantic Media’s CityLab earlier this year on a group of runners who pick up trash in Shanghai, China. 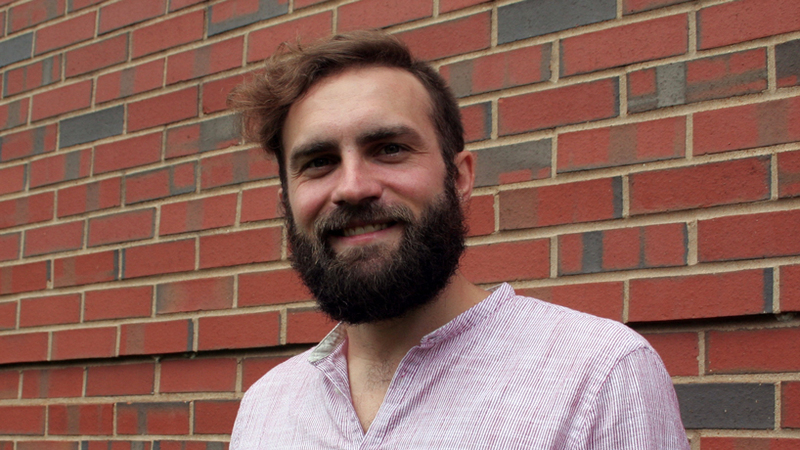 Krull, who moonlights as a freelance journalist, spent an additional three weeks after his fellowship traveling in China and reporting several stories for American publications. He published a story in the Columbia Journalism Review about Li Zixin, the founder of China30s.com, which touts itself as China’s first nonfiction writing incubation platform, and he also wrote about a group of runners picking up trash in Shanghai for Atlantic Media’s CityLab site. His most extensive reporting was for the recently published Riverfront Times piece about Tim Hermann, the CEO and board chair of the multimillion-dollar specialty construction firm Collins and Hermann, who has been helping support the St. Louis-Nanjing Sister City Committee. His involvement started after a friend fixed him up and he began a romantic relationship with a middle school teacher from Nanjing named He Jian Ping. Glassman, a former president of the committee and still a member of its board, confirmed Krull’s reporting about what an asset Hermann has been.